You can always bake berries into a cobbler or pie, but when you have a basket of ripe berries, sometimes the best thing that you can do with them is show them off in their natural state. This easy to make Mixed Berry and Mascarpone Tart is a perfect dessert for showcasing berries. It starts with a sweet, almond shortbread tart crust that is filled with a creamy mascarpone filling before being topped with fresh berries. The most time consuming part is making the crust – and that only takes a few minutes. The flavor of the crisp, butter almond shortbread with the cool filling and super sweet, in-season berries can’t be beat. I use mascarpone cheese in this filling because it has a nice creaminess and a slightly sweet flavor that really sets off the berries very well. Cream cheese could be used as a substitute, but it has a stronger flavor and will be a more dominant element when the tart is served. Feel free to adjust the amount of confectioners’ sugar in the filling to your tastes, adding a little bit extra if you prefer your filling to be a little bit sweeter. I stuck with a simple combination of raspberries and blackberries for my fruit here. They are about the same size, which gives the tart a nice look, and their flavors go very well together. Don’t hesitate to mix up the berry combination with blueberries or boysenberries, too! 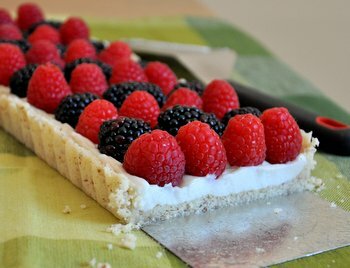 I think that the tart looks stunning with neat rows of fresh berries, but you can actually use all kinds of fruit as a topping. The tart recipe is for a 10-inch round tart, but you can see from the photos that it can also be made in tart pans of different sizes. Since this is a no-bake filling, you don’t need to worry about baking times and pan sizes too much with this recipe. Press your tart dough into any shape tart pan – round or rectangular, large or small – and bake the crust until it is just golden (the baking times are very similar to the full size tart, as long as the crusts are a similar thickness), then you’re ready to fill. If you do happen to have a rectangular tart pan, I definitely recommend it as it is easy to decorate and serve in this format. In a large bowl, beat mascarpone with confectioners’ sugar, cream and vanilla until mixture is very smooth. Pour into prepared crust and spread into an even layer. 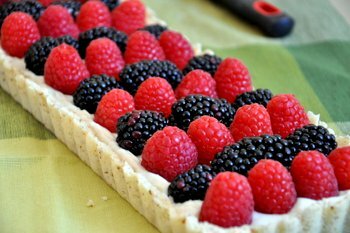 Top mascarpone filling with fresh berries, arranging them in rows by color. Refrigerate for at least 30 minutes before serving to firm up the filling. In the bowl of a food processor, combine flour, almond meal, sugar and salt. Pulse to combine. Cut butter into several pieces and add to flour mixture. Pulse until mixture is sandy and butter is well-incorporated.This can also be done by hand, cutting the butter in with your fingertips. Pour crumb mixture into a 9 or 10-inch tart pan (or 4 individual tart pans). Press firmly up the sides and into an even layer on the bottom of the pan. Bake at 350F for 15-20 minutes, until firm and light golden. Allow to cool before filling. This crust can also be used with a filling that needs to be baked, and should not be prebaked for those types of recipes. Makes 1 9 or 10-inch tart. 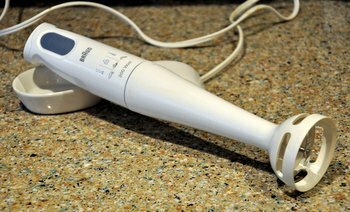 Next PostNext What is an immersion blender? the tart looks so pretty and delicious. Those berries are picture perfect. Love the idea of the mascarpone cheese in the filling. It looks amazing and sounds delicious. I made this tonight. I used only raspberries, and a 9″ round tart pan. It was a huge hit with all of us. Thanks! can you substitute something else for the almond meal? if so, what?